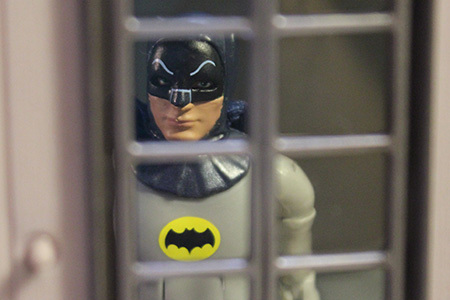 As a fairly serious “modern” Batman collector (in that I don’t have the scratch for awesome vintage collectibles), I’ve recently found that I’ve run out of current Batman figures to collect. 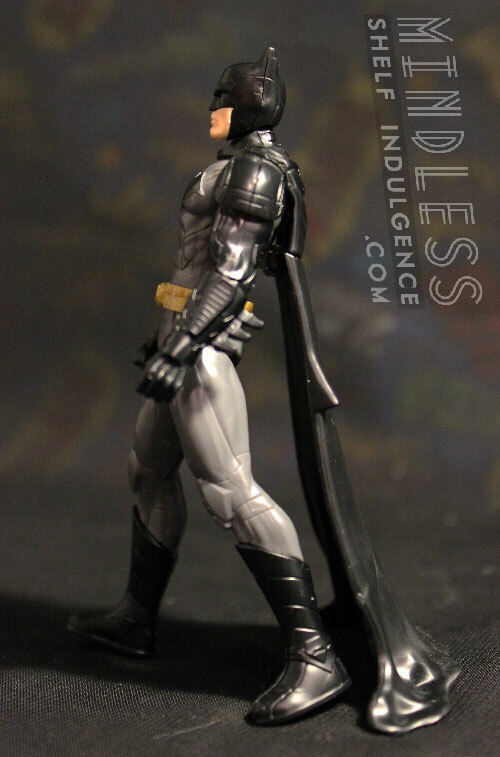 I have just about everything that DC Direct and Mattel has made, I have minimal interest in Batman figures based on video games, and I’ve only really been into artistic interpretations of the standard black, grey, and blue. Call it acquisitive restlessness, but my narrow scope of Batman collecting has expanded to encompass horrible movie variants and even the dreaded “New 52” Batman. Much of my preoccupation with collecting Batman and related artwork has centered around how different individuals perceive Batman as a creation, whether they’re professional artists or amateur fans. 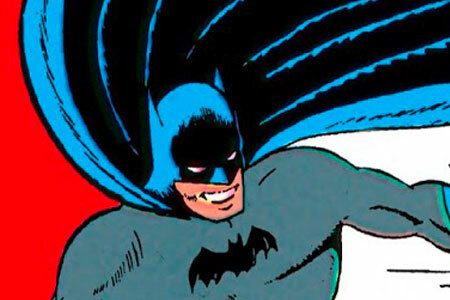 Everyone has a different vision of Batman for a different reason, and that’s a great testament to the breadth of a character that has evolved in many directions over the course of decades. I’ve realized lately that individuals’ perceptions of Batman are influenced, at least partially, by crass commercial perceptions of Batman. When Kenner made a neon green Batman and told kids that his new costume was designed for fighting Killer Croc in the swamp, that became as much of the personal Batman mythology as any comic book would. When I was a kid, the Ninja Turtles’ Slash was just a really ugly turtle who wanted to fit in, not a bad guy. 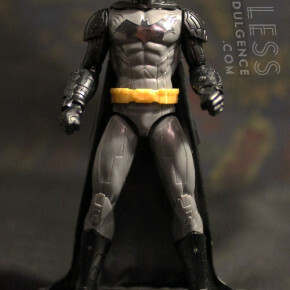 And in fairness to Batman’s crazy toy costumes, many comics also incorporated different situation-specific costumes that Batman wore to combat certain enemies. It was more of a Silver Age thing, but that’s when things were more fun anyhow. All Batmen are relevant to the Batman Whole in one way or another, no matter how weird they are. It’s in this spirit of inclusiveness that I accepted Bandai’s Sprukits into my home. I needed a new Batman in my life that was a bit different than the others, and it just happened to be on double clearance. Even after the mollification of a deep discount, I feel like I was ripped off. 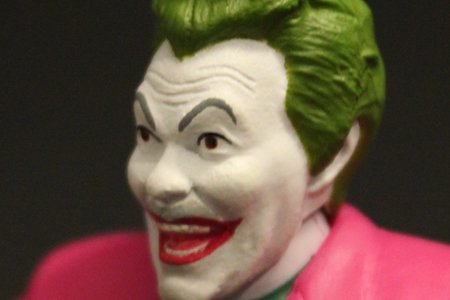 The MSRP of a Level 1 Batman Sprukits set is ten bucks, so one may reasonably expect to be purchasing something at the quality of a $10 action figure, more or less; your average 3.75″ Star Wars or Marvel figure. Somehow, manufacturers have the idea that selling unassembled toys of lower-quality plastic allows them to charge the buyer more money, presumably for the fun, fun luxury of putting together your own toy. This kind of strategy really only works for LEGO, and that’s because you can make whatever you want. 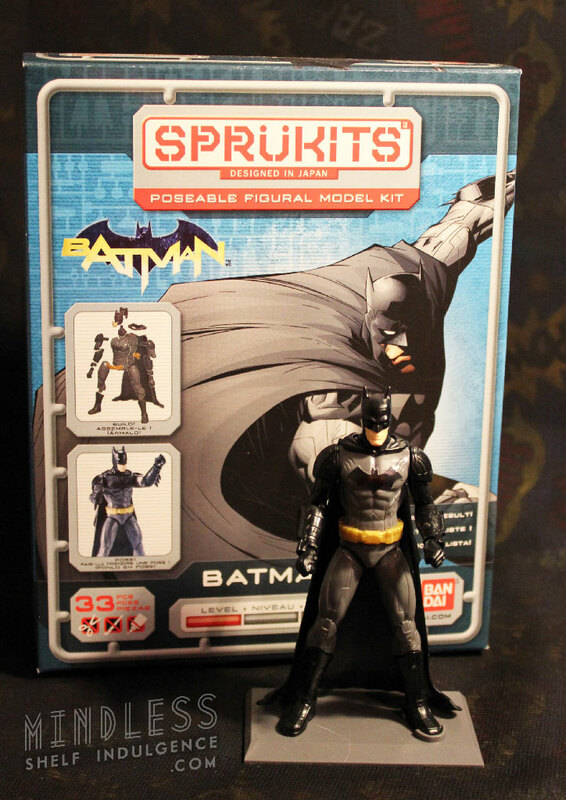 Sprukits Batman (Level 1) has a number of simple parts spread across a number of sprues, thus the name of the model line. They’re easy enough to pop off of their plastic frames, trim a little with some cuticle trimmers, and pop together – no glue or paint required. As model kits go, it’s simple and tiny, and it’s fairly detailed. And unlike most model kits, this one has points of articulation: neck, hip swivels, elbow swivels, and a weird mid-cape hinge. So, nothing useful. 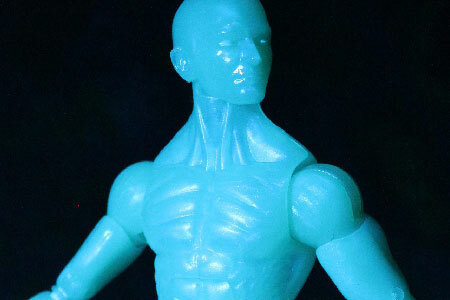 The instruction manual seems to believe that the figure also has shoulder swivels, but that requires the removal and replacement of the arm entirely – and only in four positions. Doesn’t count, guys. I could do a lot of weird things with my arm if I ripped it off too. Perhaps the most frustrating aspect of this is the fact that certain details have to be applied as stickers. 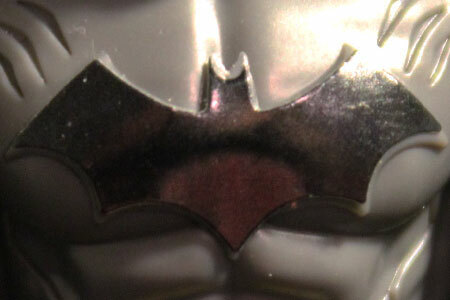 Batman’s iconic chest logo isn’t a black piece that you could just pop in, although that would have been the most beautiful and simple solution – it’s a sticker that you have to apply. Fine, but that sticker doesn’t even have the logo’s bat-ears cut out. 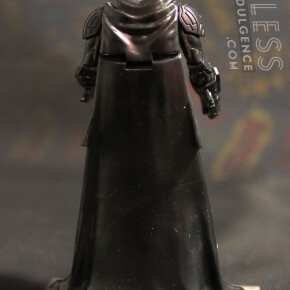 Those are two 1mm cuts that you’ll have to make yourself, because Bandai couldn’t be bothered. 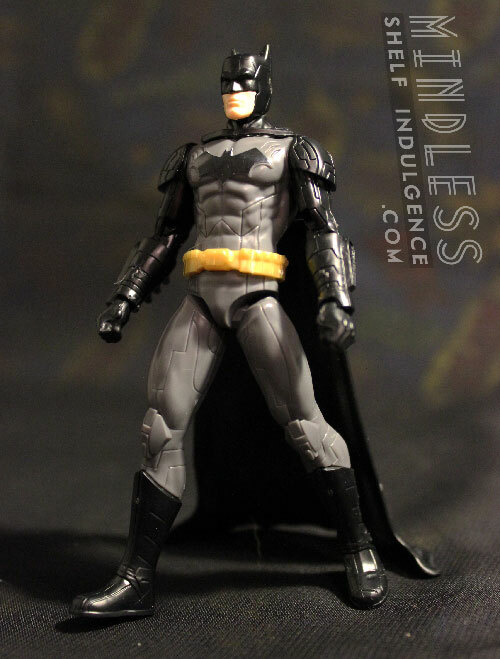 The worst cheap out, however, is the fact that Batman’s upper arms are cast in a solid black, which is weirdly off-spec for the standard New 52 Batman design, and especially unfortunate considering that most of the model is already cast in the appropriate grey. It doesn’t match the box illustration, it doesn’t match the art of the actual model on the box, and it’s lazy. 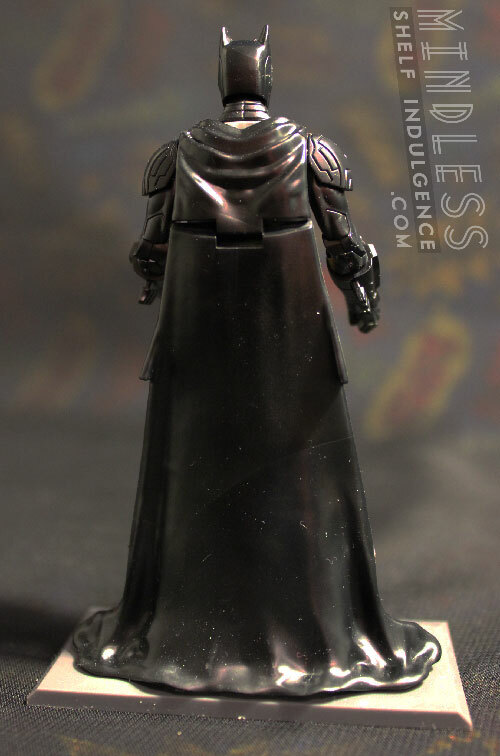 At best, this Batman’s weird shoulderpads come close to the control art for Injustice: Gods Among Us, a next-gen video game featuring Batman as a playable character, but this isn’t mentioned anywhere on the box. So, instead of being given grey arms, you’re given stickers. 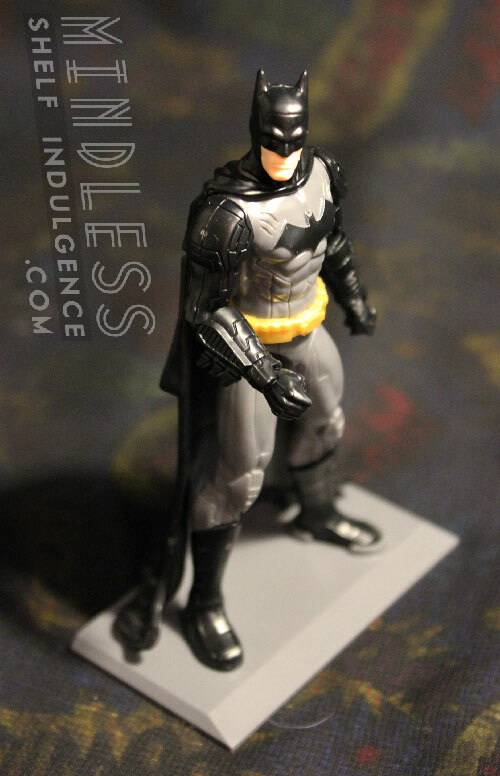 I’m led to believe that this is supposed to be Injustice Batman, but something happened with the licensor at the last minute and this box illustration was just close enough to get by. Anyone who knows about 3D design or making sandwiches or living in any part of the real world knows that you can’t just wrap a flat object around an irregular object and have it confirm to that shape. This is why you can’t wrap a map of the world around a basketball and call it a globe. 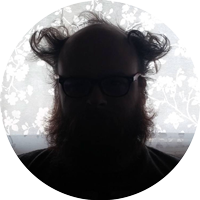 There are projections and curves to consider. Now, consider wrapping a simple sticker around the weird curves of a bicep. It’s just not happening. Maybe a few smart cuts in the sticker before going to manufacturing could have saved this aspect, but it’s too late now. 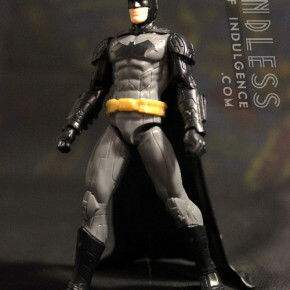 Because I could not bend the laws of space and time, Batman’s arms remain black. I haven’t yet found an image from a model builder of this kit in which the stickered arms actually look acceptable. They still have inscribed lines which would be mirrored by the stickers, but it’s just not happening. 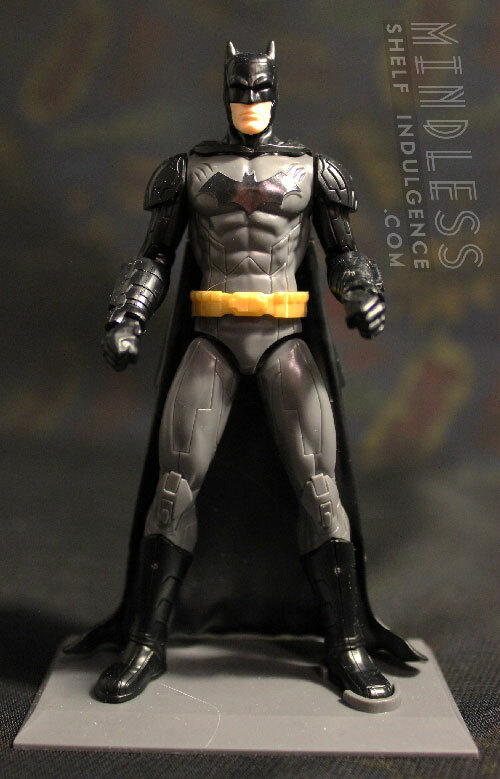 I’m aware that this is a fairly low-level kit, and that levels two and three in this series have a great deal more detail and articulation, and fewer stickers, but even at the clearance price of $6.50, and even as a pretty big Batman fan, this doesn’t live up to the price. But in another weird way, it’s iconic of the way that companies, for countless years, use Batman’s popularity as a cash grab. 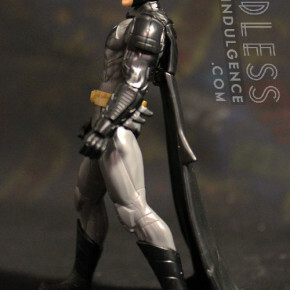 If this Sprukits Batman has any point of interest at all in its sad little stiff body, it’s that reminder. Some Batmans are just bad Batmans, and they exist… but they make the good ones that much more great. It could have been a cheaper reminder, though.